It's the summer of the apocalypse. Tom Cruise patrols a dystopian Earth in Oblivion. Giant monsters rise from the deep to destroy the planet in Pacific Rim. Even James Franco and his celebrity goof-offs face a final accounting in This Is the End. And in After Earth, directed and cowritten by Chester County's M. Night Shyamalan, from a story by the older of its two stars, Will Smith, a father and his son - played with a wiry quiver by Jaden Smith - return to a world long made uninhabitable by the mistakes of humankind. "You can easily do an analysis," says Shyamalan, on the phone and back at home after a transcontinental jaunt to promote his $130 million film, which opened Friday. "If you think these movies take 21/2 years from inception to screen, there were probably events that went on within that previous year - a tsunami, an oil spill - that really touched the zeitgeist. And there's a billion artists reacting to that, whether it takes the form of a novel, a play, a painting, or a movie. It makes you think reflectively. "And this movement right now toward science fiction is because our minds are going there. Like, how can we fix this? What does our future look like? Those thoughts come to us when we feel vulnerable." 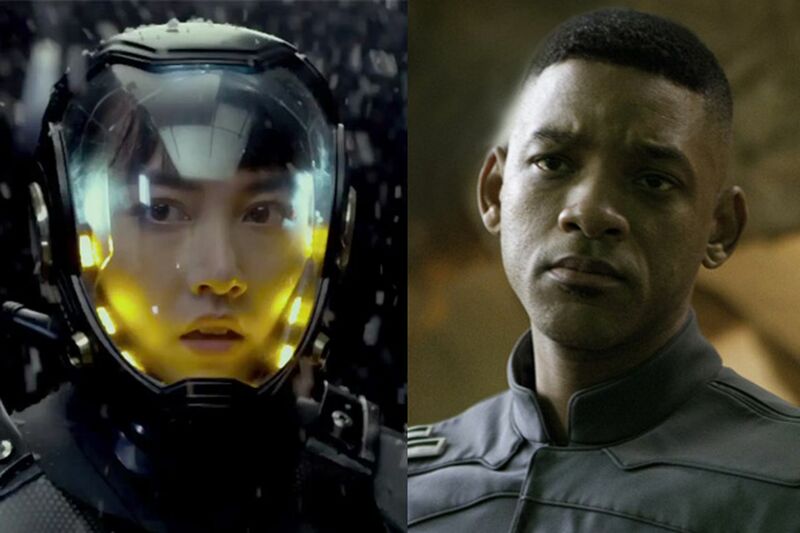 In After Earth, set centuries from now, those people who can have relocated to another galaxy. The crash of a spaceship carrying the Smiths' characters - a fearless general and his not-so-fearless teenage boy - brings them back to the old orb, now a lush, Eden-like place. But an Eden crawling with killer baboons, deadly parasites, and an alien marauder. Jaden's Kitai must make a solo trek across this wild, and wildly scenic, terrain to find a beacon that will bring a rescue party from across the universe. Smith and Shyamalan, a couple of local boys who made good, have been talking about collaborating for years. After The Sixth Sense put Shyamalan on the industry's A-list back in 1999 (its international box office: $678 million), the Fresh Prince of Bel-Air-turned-Independence Day/Men in Black star sent the writer/director a gift. They hadn't talked before. "It was an album to keep mementos, a beautiful thing, but I didn't know it was from him," Shyamalan recalls. "I couldn't read the handwriting, and I had to call the store, a Los Angeles store, to see who sent this. And we called and found out it was from Will, a kind of congratulatory present for The Sixth Sense and what was happening there. "I was like, 'What a sweet guy to send that!' And our friendship bloomed." Shyamalan visited Smith on the set of 2007's I Am Legend (yes, a postapocalyptic sci-fi tale). "We talked about the kind of movies we wanted to make together - the back and forth of it all was beginning." After Earth was shot in the rain forests of Costa Rica and the redwoods of Northern California. And on the soundstages of Philadelphia. "Anything interior, anything like a CGI hangar, or the spacecraft, those kind of scenes, that was Philadelphia," reports Shyamalan, famous for not wanting to stray far from home. The director spent almost a year in preproduction, collaborating with designer Thomas E. Sanders on the look of the planet Nova Prime, its curvy, sky-high abodes, its future tech and transportation, like the Hesper spaceship. "We ended up with the idea that the culture would have gone more naturalistic, more nature-influenced," he says. "And that ship was based on a manta ray, the shape of that. But if you see the 3-D imaging of the ship, if you slice it in half, it looks like coral, and Tom made a real effort to make everything undulating and organic, and so none of the hallways have right angles and they're always curving just a little bit - which added such great cinematic value to the things that were going on." After Earth marks only the third time in his career that Shyamalan has worked from an idea that didn't spring from his own head. He did the screen adaptation of E.B. White's children's classic Stuart Little, and Shyamalan wrote and directed The Last Airbender, based on the Nickelodeon animated series Avatar, and cowrote and directed Smith's After Earth. "With Airbender, I was literally working with the authors, and the same thing with this one, where I was literally bouncing off the guy - Will - who created it. . . .
"It's fun to have a partner, and it's a relief to a great extent, not shouldering everything. But now I'm writing a new spec script, for myself. Super quirky - a little quirky thing." And watch Shyamalan explain himself the evening of June 28 - live, in person - when film critic Carrie Rickey joins him in conversation at the Kimmel Center's Perelman Theater. For info or tickets, go to www.kimmelcenter.org/events, or call 215-893-1999. Eisenberg's magic act. The roles of actor and magician are fundamentally at odds, says Jesse Eisenberg, an actor who plays a magician - a card and coin huckster - in the just-out heist thriller, Now You See Me. "Magicians have a different relationship with their audience," says the star, Oscar-nominated for his portrayal of Facebook's Mark Zuckerberg in The Social Network, and a playwright and stage actor, to boot. "When I do a play and I go offstage, the audience very clearly understands what I did," he explains. "I'm not saying 'Hi, my name is Jesse,' and then I suddenly play a character - that would be the equivalent of what magicians do. They introduce themselves as who they are, they say what they're doing is real . . . and then they deceive." Eisenberg, sporting a Golden State Warriors cap and a mildly ADD air on his recent visit to Philadelphia, went into Now You See Me - directed by Louis Leterrier, and costarring Isla Fisher, Woody Harrelson, Michael Caine, and Morgan Freeman - straight from Asuncion, a stage piece he wrote and performed in. "I felt so strange, because the level of deceit is one step removed from what you do as an actor, and the relationship you have with the audience is different in a very important way." Eisenberg, 29, confesses that some of the slicker tricks he pulls off in Now You See Me were performed by professional magicians. But he did familiarize himself with a deck of cards. "There's something called a Snap Change, where you show a card and then you snap your fingers - that took me like a month to learn, practicing every day all day." Eisenberg was not, however, one of those kids who wanted to be a magician. But he did have some early insights into the craft. "When I was younger, my mother was a birthday party clown, and she was friends with the local magician - this was in New Jersey - and so he would do my birthday parties, and she would do his kids' birthday parties. They bartered. And so I kind of felt like I was on the inside a little bit." Contact Steven Rea at 215-854-5629 or srea@phillynews.com, or follow on Twitter @Steven_Rea. Read his blog, On Movies Online, at www.inquirer.com/onmovies.